Cultural events can shape the way a song is received, and the Gershwins’ tunes are no exception. In this second post of the “What Makes a Hit” series, we will focus on how the advancement of radio astronomy and the Great Depression played a role in George and Ira’s success. And if you haven’t read the introductory post, head here to learn more about this 8-part series! It’s impossible to separate a popular song from the moment in which it was written. An understanding of a work’s historical context can give us particular insight into the public’s reaction. So before we delve into a critical study of some of the Gershwins’ most popular songs, let’s take a look at the decade of 1926 to 1937 in which the songs from the “What Makes a Hit” series—“’S Wonderful,” “Funny Face,” “Cactus Time in Arizona,” and “I Got Rhythm”—were written. Specifically, this post focuses on how the impact of the Great Depression, and the advancement of radio astronomy, played a major role in the success of George and Ira’s songs and how everyday Americans came to experience them. Wireless systems were developed at the beginning of the 20th century, but it wasn’t until 1932 that scientists started to explore radio astronomy—the study of radio waves outside of earth’s atmosphere. The advancement of radio astronomy was significant because it broadened the range of radio; shows were now heard nationally rather than just locally. Communications specialist Jason Lee Guthrie notes that “radio promised to bring music, news, and other content to the masses like never before.” In fact, the “masses” finally heard the Gershwins’ music for the first time during this period. Radio’s increased accessibility helped to popularize the Gershwins’ music because their songs were often played on then-developing stations like NBC, BBC, and CBS. Even though George’s music was frequently heard on the radio, he nonetheless felt the effects of the Great Depression by the early 1930s. His own popular radio show Music by Gershwin—which premiered in 1934 on NBC—proved to be the key to funding Porgy and Bess and other projects. (To learn more about Music by Gershwin, check out our earlier post here!) Although George felt the financial pinch of the Depression, he enjoyed his greatest professional success during this period. Devastated by the loss of millions of jobs, Americans looked for entertainment to distract from their woes, and many found that distraction through the Gershwins’ songs. American music scholar Alec Wilder suggests that this was because “…[George] was rarely given to sad songs, [so nothing] could have been a more welcome palliative for the natural gloom of the times than the insistently cheery sound of his music.” Many found a respite from their daily struggles in the Gershwins’ lighthearted songs. The cultural shifts and economic turmoil of the late 1920s and 1930s can tell us a lot about why a Gershwin song was received a certain way by the public. For example, “Cactus Time in Arizona,” which we’ll discuss in the fifth post of this series, flopped in part because the upbeat lyrics of the song were at odds with an Arizona devastated by the Dust Bowl and the Great Depression. 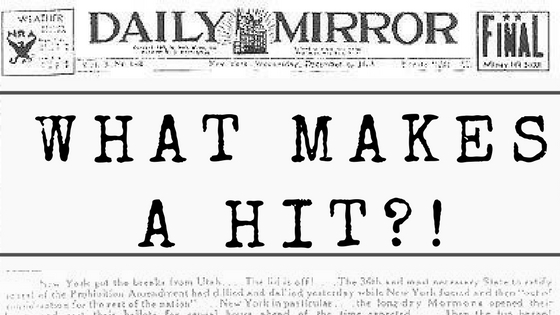 It is important to remember these historic events as we go forward in this “What Makes a Hit” series because they shaped the way that George and Ira rose to fame and how they left an indelible mark on American culture. Guthrie, Jason L. “Economy of the Ether: Early Radio History and the Commodification of Music.” MEIEA Journal (2014), 14, no. 1, 279-298.